Retail packaging is one subject that makes me a little cross eyed; I spent many months researching ways to package my items in a way that was secure enough to protect delicate items in the post and appealing enough for offline selling. Etsy is a great place for inspiration on creative and unique packaging ideas. Selling handmade products can give a little creative flexibility in how you package your items but it’s important to remember that what works for an online Etsy retailer, can often not be right when selling in a retail shop as there is a need for a slightly more professional approach. Branding is a must offline. You packaging should have impact and appeal to the customers and be immediately recognisable to your brand. Of course, professional does not mean commercial. 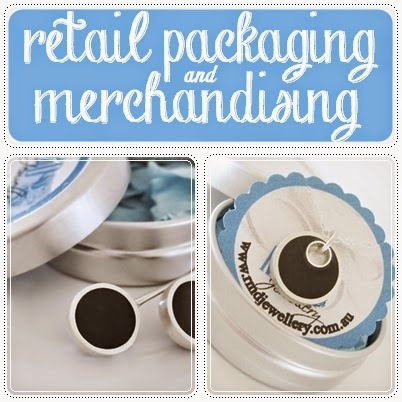 I package my jewellery in little tins with branded stickers. The look suits the handmade nature of my product but is still professional enough to work in a retail outlet. Labelling: Duh, yes I know, obvious right. Some products may need to be labelled with ingredients, like soaps and food items. But giving a good general idea of the product type is worthwhile even if it’s not required. And it shouldn't need to be said, but just in case, your business name and website should always be prominent on your labels. Colour: Complement your logo and product type with colour. Don’t package jewellery in Pale Blue if you brand is Fuchsia Pink. Of course, there are always exceptions to this and if you are using a rainbow of colours in your branding mix and match may work for you. Materials: Use materials that suit your product. Natural materials are a great option for products that are eco-friendly and recycled. I use silver tins for my modern silver jewellery. Using sleek contemporary logos and materials for retro and vintage inspired items would clash, so consider what you sell when creating your branding and packaging. Pricing: This is probably the biggest consideration. If you are selling handmade soaps for $5 or less, you cannot justify spending substantial sums on your branding. Keep it affordable, remember that even cent you spend on packaging needs to be recovered, especially for wholesale and consignment, this can affect the bottom line substantially. Think Like a Buyer: What would you expect as a customer? Branded boxes, little gift bags, tags and a paper bag? The list is endless, but the package should suit the price range and the feel of the product. If you spent $150 on perfume you would be disappointed if the bottle was handed to you in a paper bag, no box, no wrapping. Luxury items can be all about the experience, not just the product. I love when I buy myself a treat and it feels like I’ve been given a gift. The items I remember are those that are beautifully packaged, and more importantly, I almost always keep the packaging, bags or boxes. What better way to brand than having your logo in people’s faces for years to come even when the product is all used up. More importantly, I will want more so will become a repeat customer. Stamps: Custom stamps can inexpensive and very flexible, use on hand cut tags, labels, external packaging, boxes and more. Stickers: Have a generic sticker made that, like the stamps, can be used in a multitude of ways. Mini Business Cards: Mini Business cards like the Mini Moo are a great flexible branding item. Business cards, hang tags, labels on packages, jewellery cards for display and lots more. Ribbons: This is a very simple way to make anything pretty, take a basic box, add a sticker and some coordinating ribbon, pretty, simple and inexpensive but makes a lovely package for most items. And lots of places offer printed ribbons with your brand, this is a more expensive option, but a great way to get your brand recognized. To help inspire us to create beautiful and appealing packaging I have started a Packaging PInterest Group board to share with others so we can share ideas and inspire each other with great inexpensive and achievable packaging ideas and designs.